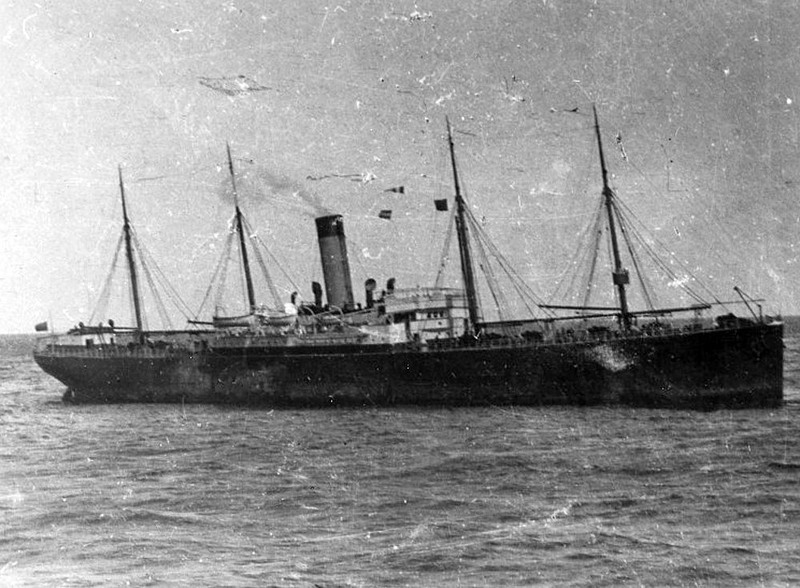 In the spring of 1912, four separate ships brought more exiled Russian Doukhobors to a new life in Canada. 1. 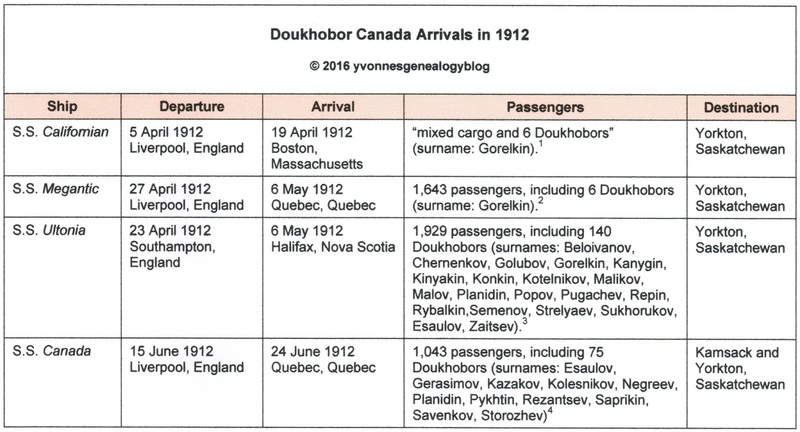 Steve Lapshinoff & Jonathan Kalmakoff, Doukhobor Ship Passenger Lists 1898-1928 (Crescent Valley: self-published, 2001), 138; citing National Archives of Canada, Microfilm Reel # T-4692. Note: There is some controversy whether or not there were passengers aboard the Californian during this April voyage. 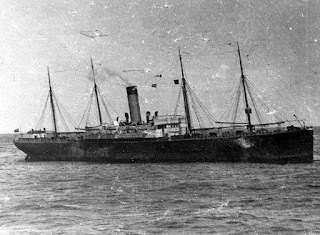 For anecdotal evidence that a six-member family travelled on that ship, see “Polly (Harelkin) Verigin: Recalling the Titanic”, Doukhobor Genealogy Website (http://www.doukhobor.org/Harelkin.html : accessed 10 April 2016). 2. Lapshinoff, Doukhobor Ship Passenger Lists 1898-1928, 139; citing National Archives of Canada, Microfilm Reel # C-4784. 3. Lapshinoff, Doukhobor Ship Passenger Lists 1898-1928, 140-143; citing National Archives of Canada, Microfilm Reel # T-4744. 4. Lapshinoff, Doukhobor Ship Passenger Lists 1898-1928, 144-146; citing National Archives of Canada, Microfilm Reel # T-4787. 5. Lapshinoff, Doukhobor Ship Passenger Lists 1898-1928, 143. 6. 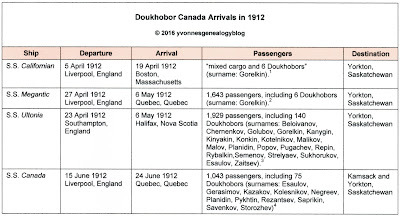 Lapshinoff, Doukhobor Ship Passenger Lists 1898-1928, 144-145. 7. Lapshinoff, Doukhobor Ship Passenger Lists 1898-1928, 138.